Taimur Ali Khan is just so adorable. Kareena Kapoor Khan is all set to celebrate her 37th birthday today. But it appears that some of the limelight has shifted to baby boy Taimur, who features in a new photograph, which is being shared on social media. The photograph appears to have initially been shared on an unverified Instagram profile, which seems like a fan club of Kareena Kapoor Khan. Taimur has his ways of being adorable and the viral photograph is only a glimpse of that. 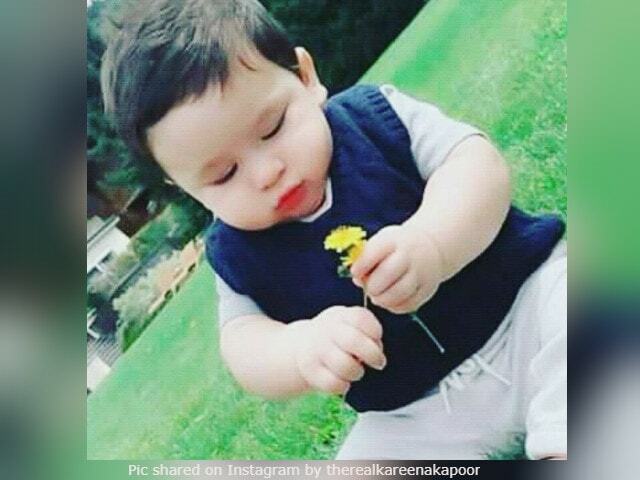 Taimur can be seen enjoying the little joys of life - a bunch of Dandelions seem to have caught his fancy. Taimur recently accompanied his star parents - Kareena and Saif Ali Khan - to a family vacation in the Swiss Alps and the photograph could be a memory from the Pataudi's Switzerland vacay. Neither Kareena nor Saif have made their debuts on social media yet, so fans and followers have to rely on fan clubs for updates. Instagram has diligently taken up the job and curated pictures from the Pataudi's ritualistic family holiday in Switzerland. Here's the one we like the best, check out Taimur's smile. Awww! The little one is still getting accustomed to the ways of being a star kid and is often spotted accompanying his mother to parties and lunch dates. Taimur is making new friends too - he recently had a play date with Tusshar Kapoor's son Laksshya. Of late, Taimur has been travelling with mom Kareena Kapoor to the sets of her next movie Veere Di Wedding, which is being shot in Delhi. Taimur also often surprises Kareena at work as he drops by on sets and lands directly on his mother's lap. Can Taimur get any bit more adorable? We think not but we hope he does. Tell us what you think in the comments section below.